http://casamigostequila.com/cocktails for 12 cocktail recipes using casamigos. I'll bring the ice PigPen! The reason for the odd Tshirt recently..? Hollywood actor George Clooney and his business partners have expanded their Casamigos Tequila brand to include an añejo expression. 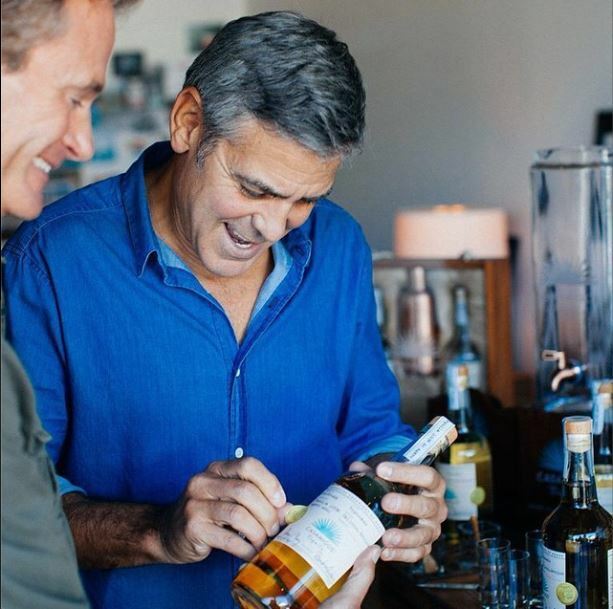 Clooney, famous for his roles in blockbusters such as Ocean’s Eleven and Gravity, and his partners Rande Gerber and Michael Meldman have added Casamigos Añejo to the brand’s portfolio, which already included Blanco and Reposado variants. It was revealed in March this year that Sidney Frank Importing Company had won the exclusive right to import and distribute Casamigos Tequila in the US and Caribbean. George Clooney starred in a steamy advertisement for Casamigos Tequila in January last year alongside former supermodel Cindy Crawford – Rande Gerber’s wife. Yum. Sounds so good. But the stuff is expensive. I drink Casamigos Reposado. it's delicious. If anyone tries the anejo let us know how it is. I would love to try it . It's so expensive that none of the stores in my area carry it! They all tell me that they have to order it by the case and don't think it would sell enough to make it worth their while. I'd love to try it if I could find someone in my neighborhood who sells it. Hope I got the link right. If not Google George. It's from Global News Canada. LizzyNY wrote: It's so expensive that none of the stores in my area carry it! They all tell me that they have to order it by the case and don't think it would sell enough to make it worth their while. I'd love to try it if I could find someone in my neighborhood who sells it. It's about $45-50 a bottle. A bit ore than some, not nearly as expensive as Patron. He probably meant all his little friends - bottles and bottles of Casamigos. In the video Rande didn't deny when the anchorwoman said he was George's best man. So does that mean he really was? There are like a thousand posts on the wedding thread... and i don't think my post was that off-topic, since it was referring to something discussed on the video, which happens to be on this thread. I understand but the thread is about Casamigos and we don't want to turn it to another wedding thread as we have so many. You can always open a new thread to discuss somthing else. I copied now the Video and your question in the thread below where you can discuss it. In this thread there are also some articles about Rande mentioned as a best man. But the only Person who can confirm 100% is George. Rande didn't seem too much at ease.....but he didn't really have a very informed interviewer. Nicky80 wrote: I understand but the thread is about Casamigos and we don't want to turn it to another wedding thread as we have so many. Ok. Just that the thought of going through that wedding thread gives me a headache . Ya we don't have a conclusive answer i think - about whether Rande was the best man. I assumed he wasn't, so a bit surprised that he didn't deny it. Joanna wrote: Rande didn't seem too much at ease.....but he didn't really have a very informed interviewer. The interviewer was warm and friendly enough. I thought maybe he hadn't gotten much sleep or wasn't dealing well with the early wake-up call and the cold weather. Yes she was friendly but got some facts wrong. and only just out. It's been nearly a year now ? Obviously not in Canada until now. "To make money of course"
Duh.......that's what businesses are supposed to do. I agree the interviewer was not on top of her questions. She could have come up with better questions but don't think she was that informed for the interview. I haven't seen many interviews that Rande has given in the past but those I have seen he always seems a bit uneasy. I just don't think he's good at them ... Seems a bit shy. I bet he wishes George could have been there with him. A little clarification Joanna. 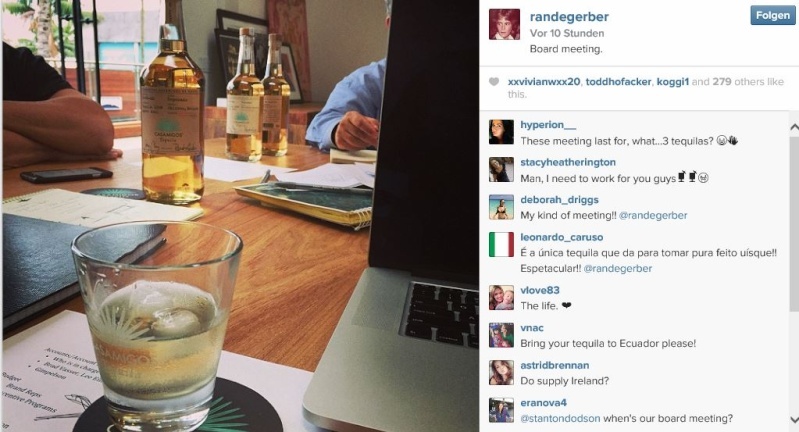 Rande started out as a model, then entrepreneur, then tequila maker. However, he continues to go on some model shoots. melbert wrote: A little clarification Joanna. Rande started out as a model, then entrepreneur, then tequila maker. However, he continues to go on some model shoots. I don't think he does any modelling these days or anytime in the last 15 yrs melbert, if u're referring to that recent Instagram pic - he did say he was spending the day doing her (Cindy's) job. So i think he was shooting some editorial/TV ad for one of his drinks (Caliche or Casamigos). Btw, remember when Rande mentioned that the follow-up Casamigos commercial was even better than the first? But they never got around to releasing it. Didn't know he used to be model. 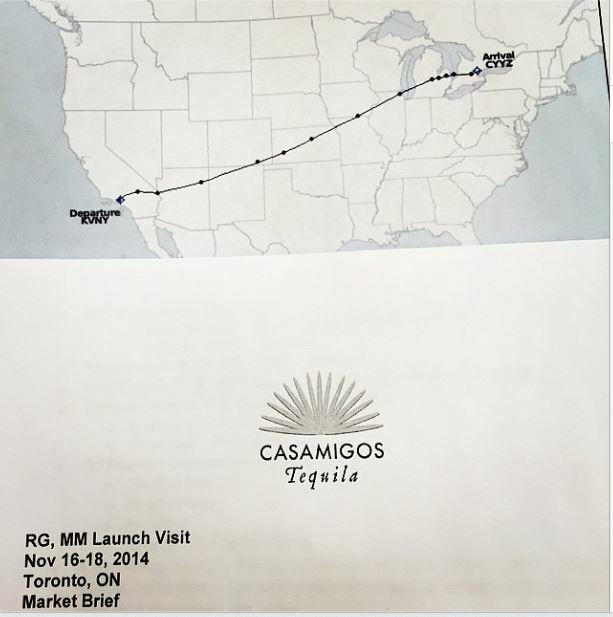 TORONTO, Nov. 24, 2014 /CNW/ - Following on the heels of the most successful and fastest growing ultra-premium spirits launch ever in the United States, Casamigos Tequila founders and owners, George Clooney, Rande Gerber and Michael Meldman, are proud to bring their award-winning Casamigos Tequila to Canada. "We love tequila. 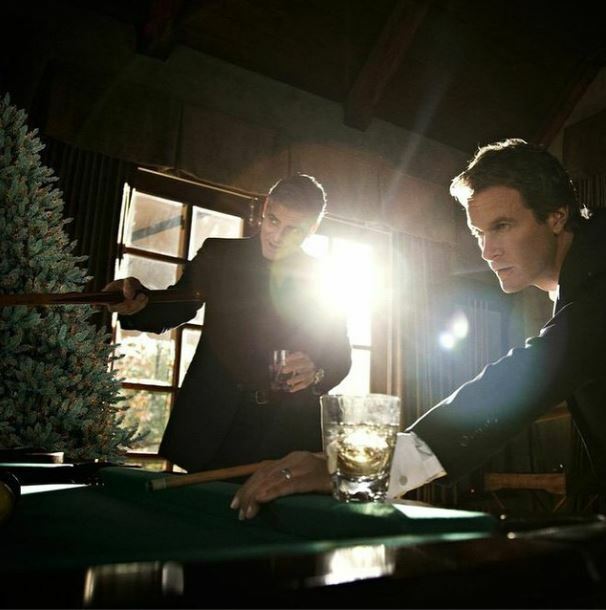 On the rocks, by the shot, at times, straight from the bottle," say George Clooney and Rande Gerber. "We are excited to bring Casamigos to Canada. It's a great feeling to share something we created, drink and are extremely proud of," added Clooney and Gerber. Casamigos is named after Clooney and Gerber's homes in Mexico, which roughly translates to "house of friends." Tequila-filled nights with friends is how Casamigos was born. Casamigos was originally created out of Clooney, Gerber and Meldman's desire to enjoy the best-tasting, smoothest tequila and was always intended for personal use, to be shared with family and friends. 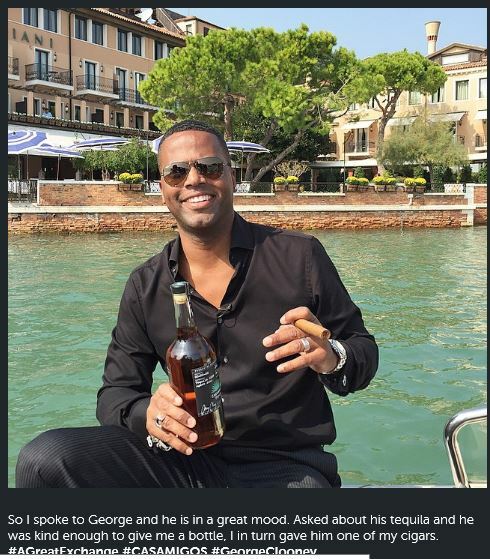 THE AMIGOS: It's safe to say these men know a thing or two about toasting good times, whether with friends and family at their homes in Mexico or at Clooney's villa in Italy. As founder of the Gerber Group and Gerber Spirits, Rande has extensive experience within the restaurant and bar industries. Casamigos follows the successful launch of Gerber's Caliche Rum, a super-premium white rum introduced in March 2012, he developed with Roberto Serrallés of Destileria Serrallés—a renowned sixth-generation family-owned rum business, which was named "World's Best Aged White Rum" by Beverage Testing Institute. George Clooney is an Academy Award-winning actor, director, producer—and now, tequila-maker. Mike Meldman's Discovery Land properties include premier private club and community developments from the Bahamas to Hawaii. "We worked on the creation of Casamigos Tequila with our master distiller in Jalisco, Mexico, for years and held many blind tastings until we knew we got it right. We've been drinking Casamigos with friends and family for over six years," says Clooney. THE PRODUCT: Casamigos is currently available in Blanco and Reposado. These small batch, ultra-premium tequilas are made from the finest hand-selected 100% Blue Weber agaves, grown in the rich red clay soil and cool climate of Mexico's Jalisco Highlands for a minimum of seven years. After harvest, the agave piñas are roasted in traditional brick ovens for seventy-two hours before undergoing an extra-slow fermentation process over an additional eighty hours, nearly double the industry standard. Our Blanco rests for two months. Our Reposado is aged seven months in the finest premium American white oak barrels, which have been carefully reconditioned after being used to age the finest premium whiskey. Our refined process ensures the smoothest tequila with no unnecessary additives and is gluten-free. In their late-night "research sessions," Gerber and Clooney preferred a sipping tequila known as Reposado, a term referring to the aging period when the spirit rests in oak barrels. This inspired the notion: "What if we made this stuff ourselves?" "Casamigos Reposado is smooth and clean with hints of caramel, while Casamigos Blanco is crisp and clear, with subtle hints of vanilla and a smooth finish. Both are great served neat or on the rocks, and are the perfect base for premium cocktails," says Gerber. Before going into the bottle, each batch is tasted and approved by our master distiller, as well as Gerber and Clooney, to ensure the highest quality. Each batch is then numbered and signed by Gerber and Clooney. Casamigos' authentic minimalist design reflects the men who created it. "We talked about how this was going to be like the bottles you see in old John Wayne movies," jokes Clooney, "where you slide the bottle down the bar, pull the cork out with your teeth, and pour yourself a shot." With the launch of Casamigos Tequila into the Canadian market, it is now available at over 200 retail locations across Western Canada and Ontario, including the LCBO and BC Liquor Stores. Casamigos is availibe at many on premise locations throughout Canada including The Keg, who in September launched a nation-wide feature bar menu with five Casamigos signature cocktails. Casamigos' social media has over 20 billion impressions, ignited by authentic content and influential friends of the brand. Casamigos' Facebook, Twitter, Pinterest, Instagram, website, and blog constantly evolve and feature exclusive content including recipes, images of the founders, quotes, special event coverage and DJ-curated playlists. Select content is then distributed via Casamigos' social media channels, allowing fans all over the world to engage with the brand on multiple platforms. Now available across Canada, the United States and expanding worldwide, Casamigos has garnered the highest accolades from the spirit industry's most well respected authority figures. Awards and ratings include the highest rated gold medals from the Los Angeles International Spirits Competition, the San Francisco World Spirits Competition, The Beverage Testing Institute, The New York World Wine & Spirits Competition, The Spirits of Mexico Tasting Competition and many more. 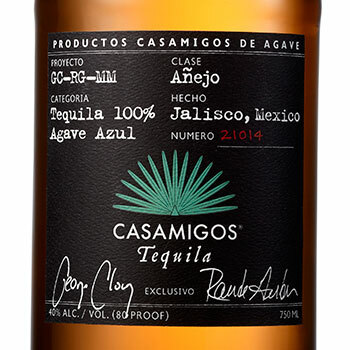 Additionally, Casamigos was rated "Excellent, Highly Recommend" by The Ultimate Spirits Challenge, received the coveted 5 star rating from BevX magazine, "A perfect tequila", A rating, from Good Spirit News, named "Best Tequila in the World" by Men's Journal magazine and Oprah Winfrey lists Casamigos as "The Smoothest, The Best." Clooney, Gerber and Meldman recently launched their Casamigos Añejo tequila to the United States market; the new Añejo offering will be available across Canada in 2015. About Casamigos Tequila: Brought To You By Those Who Drink It. Privately owned by George Clooney and longtime friend, founder of Gerber Group and Gerber Spirits, Rande Gerber, and Discovery Land Company CEO & founder Michael Meldman, tequila-filled nights with friends is how Casamigos was born. Currently available in Canada in Blanco and Reposado, these small batch, ultra-premium tequilas are made from the finest hand-selected 100% Blue Weber agaves grown in the rich red clay soil and cool climate of Mexico's Jalisco Highlands for a minimum of seven years. Casamigos Reposado is smooth and clean with hints of caramel, while Casamigos Blanco is crisp and clear, with subtle hints of vanilla and a smooth finish. For more information on Casamigos Tequila, please visit www.casamigostequila.com, follow us on Facebook at Facebook.com/casamigostequila, and on Twitter, Instagram, and Pinterest @Casamigos. Casamigos Blanco and Reposado tequilas are 80 proof and is available in 750ml bottles. Suggested retail price ranges between $59.00 - $69.00 for Casamigos Blanco and $69.00 - $79.00 for Casamigos Reposado. Please note that product prices vary per province, please contact your local liquor store for pricing. Yes, you read the headline correctly. Though George Clooney may be known for his acting chops, it would come as no surprise if he left it all behind for his unique sideline business: tequila. Two years ago, Clooney teamed up with longtime friend Rande Gerber to create Casamigos Tequila, and business is booming. This story appears in the December 15, 2014 issue of Forbes Life. Among the many virtues of launching your own ultrapremium tequila are the hours you get to spend on “research.” After all, who better to test your agave alchemy than a focus group of your closest friends? Which is precisely how Casamigos was born. Named after the twin vacation houses that Rande Gerber and his wife, Cindy Crawford, share with George Clooney in Cabo San Lucas, Mexico, Casamigos–a portmanteau of “House of Friends” in Spanish–came to life because Gerber and Clooney couldn’t find a tequila that was up to their high standards. So they did. After consulting with friends who lived in the area, the duo worked with a master distiller in Jalisco, Mexico, to find the exact flavor profile they were after–something with no burn or bite. Gerber and Clooney were partial to a Reposado–a mellow, balanced tequila, which is aged in oak barrels for several months–so that’s what they set out to make first. They ultimately settled on a blend of 100% Blue Weber agave that’s slow-cooked in a brick oven and given a long time to ferment. The result is an intensely smooth tequila whose flavor doesn’t have to be masked by salt and a lime. “Even my wife just drinks it on the rocks,” Gerber says. “And you don’t get hungover from it,” he swears. Gerber and Clooney never had any intention of bringing their tequila to market when they first started their quest, but with the encouragement of their famous friends (and grateful taste testers), Casamigos was launched–with a third amigo, Discovery Land CEO Mike Meldman–in January 2013. In less than two years, it has become one of the fastest-growing tequilas in the country–already distributed in all 50 states, as well as in Canada, Mexico, the Bahamas and Hong Kong. In April, Sidney Frank Importing (the company that created Grey Goose) was named the exclusive importer of Casamigos in the United States and the Caribbean. As for the secret to their own 16-year marriage, Crawford says, “Even when we are upset with each other, we never say things that you can’t take back, so there is less damage. And while Gerber has focused on Casamigos (and his rum, Caliche), Crawford has expanded beyond modeling and devoted her entrepreneurial energies to her Meaningful Beauty skincare line, a signature home furnishing collection and a forthcoming book of essays and photographs celebrating her career. And sometimes, they don’t go to bed together at all. Shortly after deciding to offer the brand to the public, Gerber and Clooney sat down with a bottle of their “house tequila” at Gerber’s Café Habana in Malibu to strategize their new business venture. What happened next became the inspiration for the first Casamigos commercial. but it was an opportunity too good! If someone comes down the chimney any time soon, they're taking shots with us. Cheers! Is there a ring on George's finger? Can't tell. I can't see . Rande wears his ring. I think this was a pre-wedding pic Way2, so no ring. The ring look good on Rande. Thanks PA-N. Good interview. Rande seemed much more at ease than in past interviews. I'm really pleased that Casamigos is doing so well. I really like it myself. It's expensive so it's a special treat to make at home. Margarita on the rocks using fresh squeezed limes. No salt needed. Good to the last drop. Thanks for the endorsement, Donnamarie. We're glad you like it. You're cheque is in the post. George has hairy forearms . Let's hope he waxes his back at least.